Could you imagine anything more beautiful than doing yoga a stone’s throw from the sand and saltwater? This is the stuff of many a yogis dreams. Usually it requires an expensive plane ticket to an exotic location, not just a studio down the road. Cosmic Yoga is a stunning studio in the beachy north-western Adelaide suburb of West Lakes. It lives up to it’s name even in location alone……. Fresh, beautifully yet simply styled, it is a sensory delight. I took the trip up there to visit Inese and tried out a really solid “foundation yoga” class. Nice phrase, humbling. Not really sure of what style, what school of yoga was being taught. And I still don’t. Phew. I’m not one for rigid styles, am more interested in the spontaneous mix of whatever suits the world, picking my way through styles, forms and ideas. The vibe of the classroom energy was pretty open and generous. The fluid warm ups were great. Balancing poses with a drishti point – a point of focus (i.e, the water) were delicious. And Inese has the most exquisite yoga music playlist I had ever heard……..oh, that alone…….. But an admission. Faced with fear I am. I went as a potential new yoga teacher, CV in tow, knowing full well the distance would preclude me from going there to teach regularly, but having to keep exploring the Adelaide yoga community anyway to find my place. Despite being a teensy bit paralysed by the notion of finding my voice to teach, I’m hoping that the notion that “the best students make the best teachers” – hence the idea behind this blog – to explore our yoga community, will help me along. * There is so much more to offer students than simply becoming masterful at most poses then simply showing others how to copy those physical actions. * To create community, people who “live” yoga all day long, that’s really something. * As a new teacher, rest in the knowledge what you have to offer (that people desperately need in these times) is far greater than your fear and your inexperience. * All teachers (and students for that matter!) ideally should continue to take lots of different classes in lots of different styles. I am learning so much about what resonates with me and my true gifts as I do this yoga project. * Networking is super-important and we all need mentors and peers to walk with us on our path (aka networking with integrity). * As Amy Ippolitti’s 90 Monkeys will attest – we all need to keep training, keep meeting other teachers, keep talking about our yoga with our fellow teachers, keep supporting others who join this path. I love this quote (and really there are so very few who fall into this trap). So, it was refreshing after class to find out that the teachers at Cosmic Yoga share that philosophy of humility, that they are “new” too, they are open to learning more and they are open to giving all that they have for there community. Again, am reminded that this – what I am doing with this blog, is also yoga. And for that one wonderful day the exchange was far greater than a mere coconut water and a bliss ball. 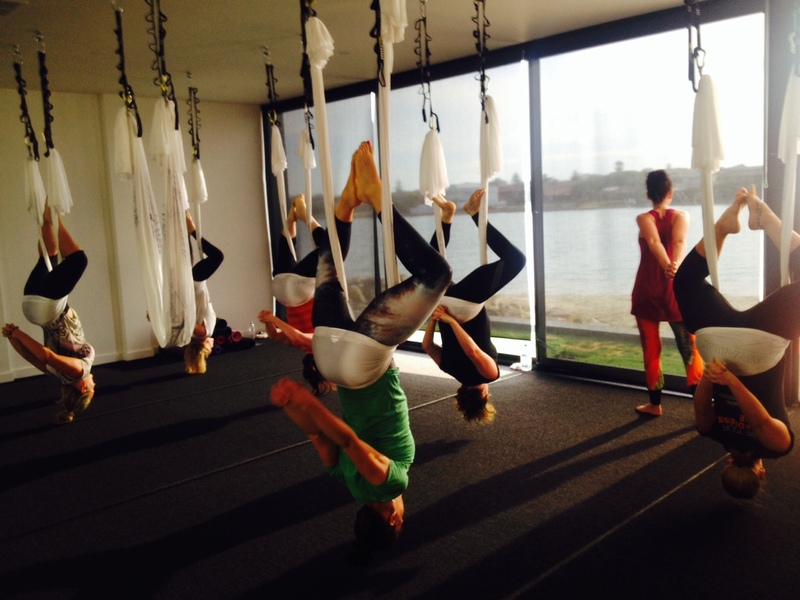 * Oh, by the way, I didn’t try aerial yoga. Will save that for another day. But here are the details…..